"He is like a woman who is charming, but no one knows why she is charming. It's beyond explanation." Marc Chagall painted a world uniquely his own. A colorist and visionary like no other, he transferred memories and imagination to canvas - and later glass - in a style that defies any "ism". Called the "grand old man" of French painting, he was the lone survivor of that last generation of masters, actively working until his death in 1985. Born Moshe Siegel, he spent his childhood in White Russia, amidst the Hassidic culture of Vitebsk. The village, its people and the decorative symbols of this time would populate his body of work throughout his lifetime. He eventually moved to Paris, and remained in France most of his life. This documentary begins at La Ruche (the "Hive"), a cluster of ateliers designed by Eiffel, where Chagall had such fascinating neighbors as Matisse, Modigliani, Soutine and the poet Appolonaire. A young artist occupying Chagall's studio in 1985 is inspired to seek out the artist, "...to find out how Chagall came to paint like [this], and why." As with many of the painters of his day, Chagall had his critics. At worst, they called his decorative, folky style naïve; at best, they labeled him a mystic, meant as an insult. But the artist responds: "...without mysticism, would a single great painting, a single great poem or even a single great social movement exist in the world?" As this program was created the year the artist died, he declined, understandably, to participate. It is, however, a rich construction of contemporary footage of the young artist visiting Chagall's haunts in Russia and France; priceless footage of the master at work, primarily on his stained glass paintings (with Charles Mark); a myriad of photos and museum shots of the actual works and the obligatory stock footage of the various eras and locations. Excerpts from his autobiography add a rich layer of history, treating us to the artist's thoughts and memories in his own words. A long list of the Chagall's works represented include his most famous installations: The ceiling at the Palais Garnier (Paris Opera House); the windows for Hadassah University in Jerusalem and the Art Institute of Chicago; scene paintings for Massine's Aleko (1942) and Stravinsky's The Firebird (1945) ballets. There is an inspired presentation of The Birthday, a magical painting celebrating his love for his wife, accompanied by a reading of what Bella Chagall had written about the moment her husband captured on the canvas. Most striking are his post-World War II religious paintings, including The White Crucifixion, which depicts an unmistakably Hebraic theme, with the figure on the cross wrapped in a talit. There is no denying that the war redefined his early Judaic symbols into mature religious visions—these later works are rich with agony and an inspired sense of awe. There is something emotionally powerful in these deceptively naïve paintings that first read as decorative Russian folktales, but soon haunt like a kaddish for the past . This documentary style is interesting but tends to distract a bit from the main focus of the artist's life. 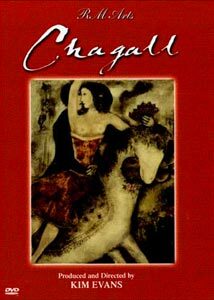 However, as Chagall was a visual storyteller, having this young guide lead us as he journeys through Chagall's past seems somewhat fitting. Image Transfer Review: As with others in this series of South Bank/RM Arts programs from Image, this documentary is composed from varying sources, many of them showing signs of age and abuse. The archive clips are the worse for wear, but this is in the source; the transfer seems fairly direct. Black levels are decent, but color ranges from good to soft and muddy. While nothing replaces viewing the actual works "in person"—especially, in this case, the stained glass windows—this is still an excellent study and an acceptable transfer. There is fabulous footage included from 1942 of Massine's ballet, Alesko that I wish I could see restored sometime. Audio Transfer Review: The Dolby Digital mono track is fine overall, with only bits of drop out in the 1969 footage of Chagall at work. With the many sources drawn together here - including a dutiful and subtle soundtrack that ranges from Stravinsky to vintage Klezmer music - the quality varies but is good overall. Extras Review: No extra features are included with this series. A well-designed static menu has 8 chapter-stops (the last of which contains the closing credits). There are so many things I could wish for - a separate gallery of the selected artworks, a critical essay or a chronology of the artist, among others - but I am patient, hoping for a time when this genre gains in popularity and this sort of feature commands a larger budget. A girl can dream, no? Marc Chagall was a vivid, dynamic artist whose career spanned the better part of his 97 years. This is a fine documentary on the life and work of the 20th century's last great master. Including footage filmed in 1969 of the artist at work, this is an important addition for anyone collecting art on DVD. I praise Image for including this series in their catalogue. Bravo!